This looping movie depicts the passage of the waxing gibbous Moon through the region of southern sky occupied by planets Mars and Saturn from 14—16 July as seen from the centre of the British Isles in evening twilight. The view is 45 degrees wide, or twice the span of an outstretched hand at arm’s length. AN graphics and animation by Ade Ashford. More than seven weeks have elapsed since Mars was at opposition. 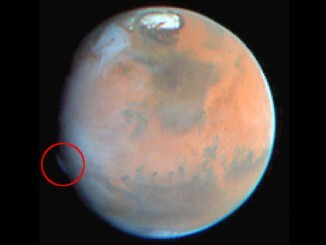 The Red Planet presently shines at magnitude -1.1 and has a diameter of around 14.7 arcseconds. The Martian north pole is still tipped in our direction, but the planet’s shrinking, 90 percent illuminated disc now requires a telescopic magnification of about 125x to enlarge it to the same size as the Moon appears to the unaided eye. 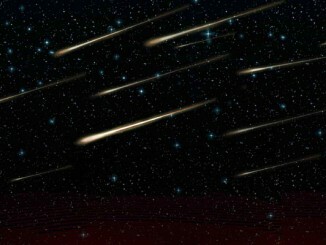 By the middle of the month, the gulf between Earth and Mars will have grown to 60 million miles (96 million kilometres). The Red Planet has also resumed its prograde (west to east) motion against the stars of Libra, hence it’s drawing closer to Saturn as the weeks pass. Magnitude +0.2 Saturn currently lies in the adjacent constellation of Ophiuchus, some 17 degrees (three-quarters of the span of an outstretched hand at arm’s length) to the left of Mars in mid-July. At this time Saturn lies 860 million miles (1,390 million kilometres) from Earth — in excess of 14 times further away than adjacent Mars. Despite its great distance, Saturn’s globe still subtends almost 18 arcseconds, while the northern face of the glorious 42-arcsecond-wide ring system is tipped a very favourable 26 degrees toward Earth. Look for Saturn’s largest moon, Titan, a magnitude +8.7 ‘star’ four ring diameters west of the planet on 19 July. This has been a challenging opposition for both Mars and Saturn from northern temperate latitudes, not only due to the far southerly declination of these planets (and hence their low altitude in the southern sky), but the particularly wet early summer has given us few opportunities to view them! As seen from the heart of the British Isles mid-July, Mars reaches a peak altitude of 14 degrees in the south close to 9pm, half an hour before sunset. In the same part of the sky, Saturn attains a maximum altitude of 16 degrees 70 minutes later. 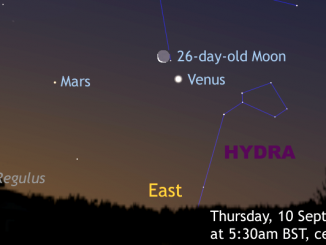 By the time twilight has faded enough to see both Mars and Saturn — around 10:45pm BST for the centre of the UK — the relative positions of the Moon, Mars and Saturn (plus first-magnitude star Antares in the constellation Scorpius) are shown above for the 14, 15 and 16 July. 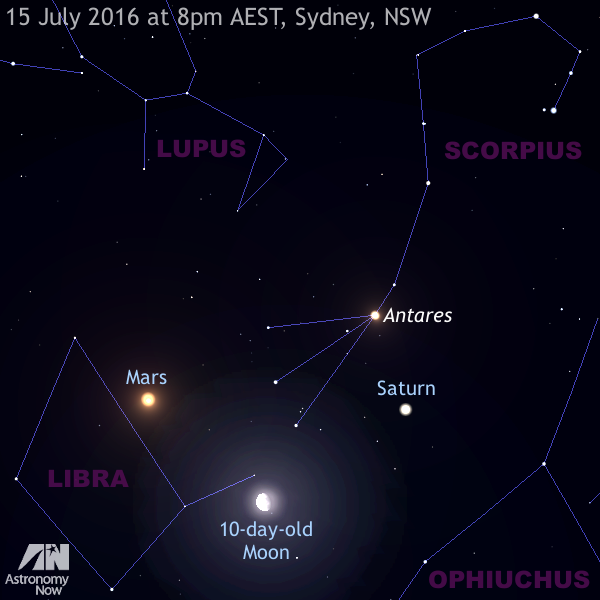 Mars, the Moon and Saturn lie to the north almost overhead as seen from Sydney, NSW at 8pm local time on Friday, 15 July. AN illustration by Ade Ashford. In complete contrast to the poor UK aspect, observers in Australia and New Zealand can enjoy ochre-coloured Mars and golden yellow Saturn almost overhead in the north around 8pm local time mid-month. A Martian surface longitude of around 200° is currently presented to Earth mid-evening, so expect to see the Mare Cimmerium, Cerberus and Elysium prominently displayed (don’t forget to consult our interactive Mars Mapper to see the face of Mars presented to our planet at other dates/times). On Friday, 15 July around 9pm local time in New Zealand (7pm AEST in southeast Australia), the 10-day-old waxing gibbous Moon lies below and between the red and the ringed planets. Saturn also lies within a low-power binocular view of first-magnitude star Antares in Scorpius this night. July is an ideal time to look for the so-called Cassini Division, a 3,000-mile (4,800-kilometre)-wide gap between Saturn’s A and B rings. What’s the smallest telescope and magnification in which you can see this dark line? Find out more about observing the Moon, Mars, Saturn and the other solar system bodies currently in the night sky in the July 2016 edition of Astronomy Now. Research just published in Nature describes two bright, extremely high-altitude plumes observed on Mars by amateur astronomers in March and April 2012, but attempts at explaining the phenomena defy our current understanding of the Martian upper atmosphere.